50 Bedford Square, London WC1B 3DP. 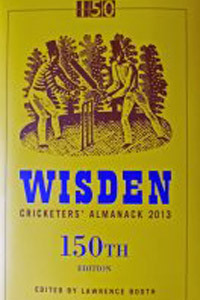 The landmark, 150th - or sesquicentennial, as is mentioned - edition of the Wisden Cricketers' Almanack has once again been released and, once again, is a mine of information for all devotees of the game. In a way, it is nice to see the original format reverted to for this 150th edition. Lawrence Booth, in his second year as editor of the Cricketers' Bible, as usual, writes eruditely and there is an interesting section early in the Almanack about what editing this most famous of cricketing books meant to previous editors. The accolade of Leading Cricketer in the World goes to Australian, Michael Clarke, after a remarkable year of high scores. Just before the Almanack was released, Australia endured a miserable time in India but it would be remiss to write them off in different conditions just ahead of another Ashes series. The five cricketers of the year included three South Africans, Hashim Amla, Jacques Kallis and Dale Steyn, who did so much in England last year to become the top placed Test playing nation. Nick Compton, whose phenomenal season with Somerset led to his England debut in the winter, is also included and Marlon Samuels is the other player, a player who has now made the most of his talents as a batsman and bowler. Another interesting section is Wisden's Ten Moments in Time: events which had an effect on the game and which include the Gillette Cup, Hansie Cronje admitting to match fixing and the first IPL Auction in 2008. In a book of almost 1600 pages, there is much space devoted to not just the excellent coverage of play all over the globe but tributes paid to the recently departed and, surely during the forthcoming summer, much missed Christopher Martin Jenkins; valedictories to recently retired internationals Rahul Dravid, V.V.S.Laxman, Andrew Strauss and Ricky Ponting, all fine cricketers and men; Sachin Tendulkar's remarkable achievement in becoming the first cricketer to score 100 international hundreds: Ponting, with 71, seems a distant second. In his Editor's Notes, Lawrence Booth is critical of Kevin Pietersen and the disruption caused during the second Test against South Africa whilst also understanding of the schedule top players face and the understandable desire to be part of the IPL riches. Patrick Collins in a later article goes into depth about l'affaire Pietersen. There are some terrific photographs with Chennai's - formerly Madras - Marina again appearing although cricket has been banned from the beach, archery at Lord's, the opening ceremony of the London Olympics and a Maasai tribesman cutting a fiersome sight as a quick bowler in Mombasa. The joint winners of the MCC-Wisden Cricket Photograph of 2012 are Robert Cianflone's photograph of Hashim Amla surviving a run out and Somenath Mukhopadhyay's sunrise photograph of three boys playing cricket in West Bengal. In short, Wisden 2013 is another masterpiece, very worthy of its 150th year and a must for all fans of the game.